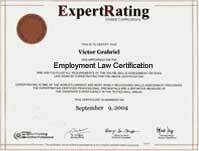 (leading to ExpertRating Employment Law Certification). You’ll gain an inside view of the law with court examples, real situations, and prevention strategies that prepare you to effectively resolve workplace issues. You’ll learn effective communication techniques, negotiation strategies, and what to expect if you do go to court. This course is a must for anyone who is (or aspires to be) a supervisor, manager, or human resources professional. About the ExpertRating Online Law Course (Employment Law) instructor : With a law degree and masters in health law, Ann Nevers is involved in dispute resolution in areas of business, employment, and health care. She regularly teaches courses in business law, employment law, dispute resolution, and health care. She has published a number of academic articles, edited legal manuals, and written chapters on employment, dispute resolution, and health care topics. She has industry experience as a director of a regional corporation. Employment Law Fundamentals Course requirements: For taking this instructor led ExpertRating Online Law Course (Employment Law) you need Internet access, e-mail, and the Microsoft Internet Explorer or Mozilla Firefox Web browser. "This was the first online course that I have taken and enjoyed it. Very useful. Thanks for the many web sites that I can utilize in my job area. I was able to fit this into my busy schedule from the office or comfort of my home. Works for me.."
"Enjoyed the class. It was a great employment law refresher." "The instructor was very knowledgeable. She responded to everyone's questions timely, as well as complimenting them on asking good questions. She is a teacher with an extreme volume of knowledge in her file who uses this knowledge to teach her students in a very encouraging and supportive manner." "Very good class. I liked the use of examples. Thank you." "I enjoyed taking this course. It covered a variety of topics which kept it interesting & informative." "just want to let you know that I really liked this course. I am now hooked on taking online courses. I really learned a lot. I have been in HR for 11 years now and I still learned a lot. Thank you...."
"First on-line course. Enjoyed very much...look forward to another course in the future." "An excellent teacher and a very interesting course!!! I really liked the little graphics which were placed within each lesson. The lessons were written so that the lay person could understand." "This course is exactly what I needed to answer most of the questions about employment law. This is a very good course that I recommend for business people and also to employees who want to learn about their rights when they are member of a union, discrimination, etc. I'm glad I have taken this course, I learned a lot of things, and appreciated replies to my questions." "This was a terrific course and I would recommend it to everyone in the management field! A must! Ms. Nevers' lessons were excellent! Thank you!!!!" "The course was insightful, and I gained a tremendous amount of knowledge that I will be able to put to use in my occupation. I also appreciate being able to complete the course in a time frame that best fits my schedule. I am looking forward to taking my next course." "I've been in HR for a number of years and felt that a "refresher" would be helpful. I found this course to be helpful in updating current employment practices." "Ann took a lot of information and kept it interesting. Her examples were to the point. A really good course that taught me a lot." This was a great course. Really helped me with my job." "This course was very helpful to me with my own business. I will be able to have my notebook on hand if I need to look at it another time for reference. This is an area that is very much needed in today’s world. Thanks!" "I learned a lot from this course, and will implement what I've learned. I feel more confident in knowing that I know where to look for answers about employment law. I bookmarked all the websites that were posted." "I greatly enjoyed this class and would love to take another with Ann. She is a fantastic instructor and made the class interesting." ExpertRating is one of the world's only ISO 9001:2015 Certified companies (from TUV America) offering an Online Law (Employment Law) Course (leading to ExpertRating Law (Employment Law) Skills Certification). When you choose the ExpertRating Online Law Course (Employment Law) you can be sure that you are buying a premium International certification that is recognized by hundreds of employers and Government bodies in the US and other countries. With ExpertRating you get certified quickly online and you are equipped with a store house of information through the in-depth ExpertRating Online Law Course (Employment Law)ware which has been developed by experienced Employment Law Experts. The ExpertRating Employment Law Certification is by far the best value for money instructor led Employment Law Program at $129.99. How much does the Employment Law Certification cost and what does it include? You can buy this ExpertRating Online Law Course (Employment Law) leading to Employment Law Skills certification at a special offer price of only $129.99 which includes the in-depth ExpertRating Online Law Course (Employment Law)ware and exam fee. This is the best value for money Employment Law Program available till date. You get the following services within the USD $129.99 fee. In-depth ExpertRating Online Law Course (Employment Law)ware including scenarios and case studies. World wide airmail delivery of the hard copy Employment Law Certificate. The Employment Law certificate can be used to prove your certified status and does not mention the words "online". The process of getting yourself certified is very simple. All you have to do is buy the ExpertRating Online Law Course (Employment Law) for $129.99. Log in to the instructor led course using your password. Go through the ExpertRating Online Law Course (Employment Law)ware (which would take you 6 weeks) and complete the final Employment Law certification exam at your convenience. You can complete the exam within 2 months of buying the Employment Law certification. The result of the exam appears as soon as it is completed, and your Employment Law certificate is mailed immediately. Chapter assignments to help you practically use the Employment Law skills that you will learn during the Employment Law Course. The final exam is fully based upon the ExpertRating Online Law Course (Employment Law)ware that is provided along with the Employment Law certification. If you have gone through the courseware properly you should not have a problem clearing the exam. The exam consists of multiple choice questions from all chapters of the ExpertRating Online Law Course (Employment Law)ware. The specialists of Employment Law are never out of work! This career is one of the most stable careers in the world as it remains unaffected by economic fluctuations! Employment Law professionals are specialists who deal with cases related to employment rights, employment claims, workplace Employers’ Rights, workplace Employees’ Rights, employee benefits, disputes, compensations and wages. Employment law professionals need not necessarily be lawyers. What they need to possess is a proficiency in the employment laws. These professionals could also adorn the role of Human Resource managers or specialists who may hire prospective candidates on the basis of their knowledge about the employment laws. This course can be beneficial for the employers who want to be a cut above the rest by legally hiring, evaluating and managing employees and learning basic type of employee benefits. Anybody can enhance their resume with an ExpertRating Law Certificate which will make them stand out. Through this course you would gain the skills and knowledge required to be a Certified Employment Law professional. You will get an insight into the legal environment with real life examples coming straight from the courtrooms and prevention strategies that prepare you to effectively resolve workplace issues. You will also be made well versed with effective communication skills, negotiation strategies, and handling situations in the courtroom. This course is a must for anyone who is (or aspires to be) a supervisor, manager, or human resources professional. Are all workers employees? In this lesson, you'll learn to recognize the difference between an employee and an independent contractor. This will enable you to properly classify workers so you can withhold taxes and provide benefits for true employees. This lesson will take a look at a real court case to see how courts decide if someone is properly classified. Do you wish you could retire to the beach with solid employment benefits, such as health insurance, retirement, sick leave, and vacation leave in place? Today’s lesson will look at the legal requirements relating to employment benefits. You may be surprised to learn what the law does and doesn't require! This lesson will also talk about the reasons companies provide benefits for their employees. Do you ever find yourself stuck with employees who aren't producing? This lesson will focus on ways to screen applicants for employment to keep poor employees out and find a good match between the job and skill level of an applicant. As the saying goes, it's better to have strong hiring practices than to deal with a problem employee later on. Ever wonder what to do with your employees and how to keep them effectively producing? Today’s lesson will focus on evaluation, discipline, and termination processes. You'll learn how to tackle these tough issues without violating any laws in the process. If you ever have to deal with upset people at work (employee outbursts, customer complaints, or vendor concerns) then this lesson is for you! This lesson will talk about dispute resolution tools that will help you turn conflicts into win-win situations. Do you ever wonder what happens behind courthouse doors? Today’s lesson will talk about the litigation process from start to finish so that you'll know what to expect if you someday find yourself in court. It will also go over legal jargon—words like depositions and interrogatories—so that you really understand the words lawyers commonly use. While discrimination should be a thing of the past, prejudice still pops up in the workplace. This lesson will talk about how to comply with Title VII law, which prohibits discrimination at work. The examples and strategies discussed in this lesson will make this law easy to understand. Has anyone ever requested a special accommodation from you? Today’s lesson will explore what the laws are about this issue. You'll find out what your duty is regarding accommodation and learn to analyze your workplace to determine whether it's compliant. Suppose there's labor talk whispered in the halls of your workplace. What do you do? Lesson 9 will discuss the legal rights of unions to organize. It will also consider unfair labor practices that both unions and management need to watch out for. Collective bargaining, grievance and appeal, strikes—what do these things have in common? They're all processes that can occur in a union environment. Today’s lesson will talk about how to prepare for and handle union bargaining and appeals. What are your obligations when it comes to keeping employees safe on the job? This lesson will focus on employee safety and reporting. You'll get Internet resources where you can look up specifics about your particular work environment. Legal compliance requires an entire corporate strategy. Today the final lesson will focus on tools, tactics, and resources you can use to create an environment of compliance in your workplace.